Or lights in general, the King and I knew that we had to take her to our local Botanical Garden's "Winter Walk of Lights". We went last night and she managed to keep her eyes open for all of 10 minutes. Translation-she was impressed. I am clearly relying heavily on pinterest for many of my holiday ideas...like dry brining my Thanksgiving turkey. 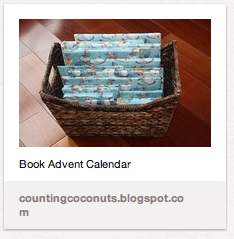 I am really hoping that the Christmas Book Advent Calendar turns out a little better than the turkey! How can you go wrong with books? My family, my own bookshelf, and Amazon have been helping me collect a ridiculous number of Christmas books to unwrap. Here's the rundown of what I have at this point. While she may not understand it just yet, it's a fun tradition to have for when she does. 11. Richard Scarry's Best Christmas Book Ever! 16. When Santa Lost his Ho! Ho! Ho! Are there any glaringly obvious ones that I am missing? That's a pretty awesome idea although it sounds like a lot of work. It's not a Christmas book but I love the Night Before Thanksgiving. It could always be opened early or saved for next year!